Kelvin Nuvagah, his wife and two children aged 10 and 7, have for the past four days been sleeping at their forest “farm-house” away from the urban centre of Bali Nyonga, a community in Cameroon’s North West region. He tells me on phone they had to flee as the military raided their neighborhood in retaliation to the killing of one of theirs by suspected armed separatist who pledge allegiance to the Ambazonia Defense Force, one of the armed groups fighting for the independence of the English-Speaking regions of Cameroon. The taxi-driver was forced to stop working weeks ago due to constant road blocks mounted by armed separatist fighters who have sworn to disrupt the normal flow of activities every now and then. He expressed concerns over the health of his children saying he doesn’t know when it will be safe for them to return home, that’s if their home has not been razed down, a new phenomenon which is attributed to military raids. His plan, when they get home is to raise money and take his family to neighboring Nigeria which according to the United Nations High Commissioner for Refugees, UNHCR now host about 30.000 Cameroonian refugees who’ve since November 2016 crossed over to the west African nation when the “Anglophone crisis” negotiated a deadly twist. They are dozens of Cameroonians who go through the same situation as Nuvagah. 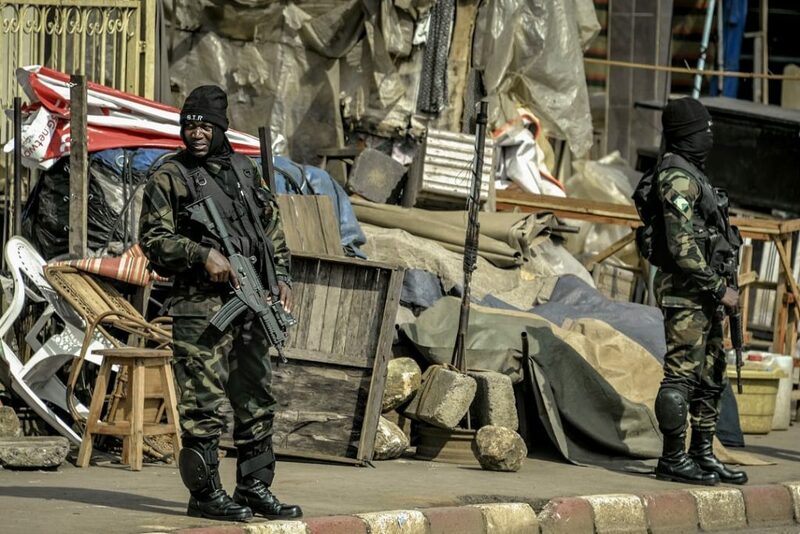 Since the commencement of Cameroon’s Anglophone crisis in October 2016, peace has since then taken a leave of absence from the Central African nation which less than nine years ago boasted of being amongst the most peaceful countries in Africa, a continent marred by civil wars. Recently, both the government and secessionists seem to have abandoned dialogue and keep re-echoing the need to prove their might to each other. The crisis in the minority English speaking regions continue to escalate as hopes for any dialogue between the government and secessionist seems farfetched. No one, not even the lawyers who staged a protest in October of 2016 would have ever imagined that they will forever reshape Cameroon’s path. During the second quarter of 2016, lawyers from the common law extraction took to the streets to protest the imposition of French language and the transfer of French-speaking judges to courts found in English-speaking regions, coupled with the fact that some basic text required for them to practice was never found in English. They would soon be joined by teachers and other trade unions. When talks failed, coupled with the arrest of some Anglophone leaders, calls for secession backed by reason such as marginalization and uneven development took central stage. Many continue to blame government for the current state of affairs as some believed that the crisis was poorly managed by the Yaounde administration. On December 31 2017, President Paul Biya took a tough stance during an interview with state-run media, CRTV declaring war on secessionists. One month later, on January 26, 2018 the government confirmed that the Ambazonian leaders arrested in Nigeria had been extradited to Cameroon. The extradition of over 47 persons included Sisiku Ayuk Tabe, the interim President and members of his close circle spark uproar prompting the secessionists fighter double their attacks on government forces, officials and the regular institution of “Ghost Town Operation” days. Government’s responds has been fierce, pushing various international organizations and counties to voice calls on the need to respect human rights while dealing with the crisis. I just want to say I am just very new to weblog and definitely liked your web blog. Most likely I’m planning to bookmark your blog post . You really have remarkable articles. Thanks a lot for sharing your web site. tadalafil lek cena [url=http://www.cialislet.com/]cialis[/url] tadalafil 5mg preise österreich. Very good written post. It will be supportive to anyone who utilizes it, as well as yours truly :). Keep doing what you are doing – for sure i will check out more posts. I am commenting to let you understand of the notable encounter our daughter found checking your web page. She noticed many things, which include what it is like to possess a very effective helping style to get certain people really easily thoroughly grasp a variety of tricky subject areas. You undoubtedly surpassed her expectations. Many thanks for showing the beneficial, trusted, explanatory not to mention unique thoughts on that topic to Sandra. wonderful points altogether, you simply won a new reader. What would you suggest in regards to your submit that you just made some days ago? Any certain? I just want to mention I am beginner to blogs and definitely enjoyed this website. More than likely I’m going to bookmark your blog . You certainly come with fantastic stories. With thanks for sharing with us your blog. Wow, superb weblog layout! How long have you ever been blogging for? you made blogging look easy. The total glance of your site is excellent, let alone the content! hello!,I really like your writing so a lot! proportion we keep up a correspondence extra approximately your post on AOL? I require an expert in this area to solve my problem. Maybe that is you! Looking forward to look you. Hi, Neat post. There is a problem with your site in internet explorer, could check this¡K IE nonetheless is the market leader and a big part of people will leave out your fantastic writing due to this problem. Just desire to say your article is as surprising. The clarity in your post is simply nice and i could assume you are an expert on this subject. Well with your permission let me to grab your feed to keep updated with forthcoming post. Thanks a million and please continue the gratifying work. I have been surfing online greater than 3 hours as of late, but I never found any attention-grabbing article like yours. It¡¦s pretty value sufficient for me. In my opinion, if all web owners and bloggers made just right content as you probably did, the web will be much more helpful than ever before. I would like to thank you for the efforts you’ve put in writing this website. I’m hoping the same high-grade website post from you in the upcoming as well. In fact your creative writing abilities has encouraged me to get my own site now. Really the blogging is spreading its wings fast. Your write up is a great example of it. I would like to express some appreciation to this writer for rescuing me from such a situation. Because of surfing around through the the net and obtaining tricks which are not pleasant, I was thinking my life was gone. Being alive devoid of the approaches to the issues you’ve resolved by way of your entire guide is a crucial case, as well as the ones that would have adversely affected my career if I had not come across the website. Your natural talent and kindness in dealing with everything was crucial. I don’t know what I would have done if I had not discovered such a subject like this. I can also at this time relish my future. Thanks for your time so much for the reliable and result oriented help. I won’t think twice to propose your blog to anybody who would like care on this topic. hello there and thank you for your info – I have certainly picked up something new from right here. I did however expertise some technical points using this web site, as I experienced to reload the website many times previous to I could get it to load properly. I had been wondering if your web host is OK? Not that I am complaining, but slow loading instances times will often affect your placement in google and could damage your high-quality score if advertising and marketing with Adwords. Anyway I’m adding this RSS to my e-mail and could look out for a lot more of your respective intriguing content. Make sure you update this again very soon..
Good day very cool blog!! Man .. Excellent .. Amazing .. I’ll bookmark your blog and take the feeds additionally¡KI am happy to seek out a lot of helpful information here within the publish, we want work out more techniques in this regard, thank you for sharing. . . . . .
I¡¦ve been exploring for a little for any high-quality articles or weblog posts on this sort of area . Exploring in Yahoo I finally stumbled upon this website. Studying this information So i¡¦m satisfied to exhibit that I have a very good uncanny feeling I discovered exactly what I needed. I such a lot definitely will make sure to do not overlook this website and provides it a glance on a continuing basis. Thanks for some other great post. Where else may just anyone get that type of information in such a perfect manner of writing? I have a presentation next week, and I am at the search for such information. Hi there, I discovered your web site by the use of Google even as looking for a related subject, your web site came up, it appears to be like good. I’ve bookmarked it in my google bookmarks. Helpful information. Fortunate me I discovered your website by accident, and I’m surprised why this accident didn’t happened earlier! I bookmarked it. Whats Going down i’m new to this, I stumbled upon this I’ve discovered It absolutely helpful and it has helped me out loads. I’m hoping to contribute & aid other customers like its aided me. Great job. I wish to point out my respect for your kindness for those who must have help with this one matter. Your personal dedication to getting the solution all-around was quite powerful and have always encouraged girls like me to realize their goals. Your new useful tutorial denotes a great deal to me and especially to my office workers. Thank you; from all of us. Thank you a lot for providing individuals with a very memorable chance to read articles and blog posts from this website. It is usually very pleasant and also full of a great time for me and my office peers to search your web site minimum three times every week to read through the new things you have got. Not to mention, I’m also at all times motivated with the incredible tactics served by you. Selected 1 areas in this post are essentially the most effective we have all had. Magnificent goods from you, man. I have understand your stuff previous to and you are just extremely magnificent. I really like what you’ve acquired here, really like what you’re saying and the way in which you say it. You make it enjoyable and you still care for to keep it smart. I can’t wait to read much more from you. This is really a terrific site. I just want to say I am just beginner to blogging and actually enjoyed your website. Most likely I’m likely to bookmark your blog post . You surely come with good stories. Cheers for sharing with us your webpage. you are actually a good webmaster. The site loading speed is incredible. It kind of feels that you’re doing any distinctive trick. Moreover, The contents are masterpiece. you have done a fantastic job on this matter! Thank you for sharing superb informations. Your web site is so cool. I am impressed by the details that you have on this web site. It reveals how nicely you perceive this subject. Bookmarked this website page, will come back for extra articles. You, my friend, ROCK! I found just the information I already searched all over the place and simply could not come across. What a perfect site. vqkfqaac,Waw! Its really great and wonderful ever i found. Thank you for sharing this info. I am asking for my mommy. She does not always wish to generate income off them, her function is to utilize her blog site (once prominent) and also use it as references to potentially assist her obtain a news article. She has a title for one called “Answers to Life’s Troubles”. Where can she upload blog sites as well as they come to be popular? She uploaded it currently on WordPress but there are 3 million individuals posting blogs hers obtains lost in the mix. Any kind of pointers?. fxhtlmsiay,Thanks for sharing this recipe with us!! wzzeisxkjzj Yeezy,Hi there, just wanted to say, I liked this article. It was helpful. Keep on posting! I¡¦m now not positive where you’re getting your information, but good topic. I must spend a while finding out much more or working out more. Thank you for excellent info I was on the lookout for this info for my mission.